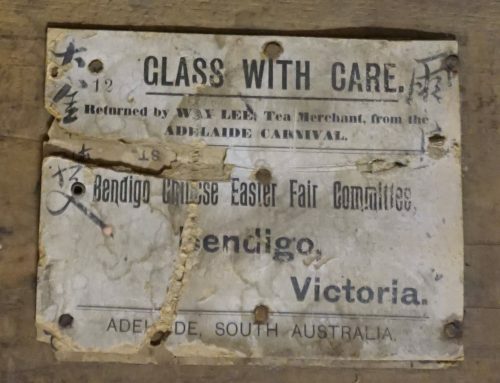 In the 19th and early 20th centuries Bendigo’s many Chinese stores, boarding houses, temples, clan associations, lodges, and festival events, all contributed to forming a cultural and commercial hub for many smaller Chinese communities in the region. Some of these small settlements consisted mainly of market gardens and their workers and were situated along major waterways such as the Campaspe, Loddon, and Avoca Rivers. One such… community was that of the Chinese market gardeners of Bridgewater-on-Loddon, about 35km from Bendigo. These gardens began production around 1861, and remained in use for a further century. Pictured in this photograph are Albert and George Chinn (originally from a Kangaroo Flat family) at their Bridgewater garden, c.1940.